The elephant costume kit with sound can be used to create a quick, easy elephant costume for Halloween and is great for younger children making it perfect for elementary school performances which require animal characters. 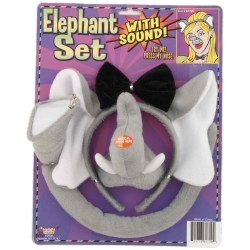 The elephant costume kit with sound includes elephant ears headband, tail, nose that makes sound when pressed, and black bow tie. Costume kit is one size fits most.